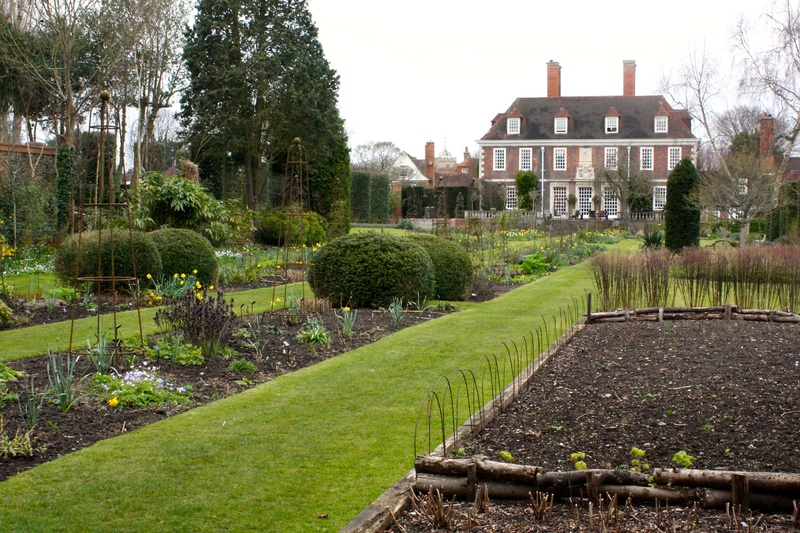 It was fitting that Gardeners’ World, in the first programme of the new series, chose to highlight the miraculous resurrection of the gardens at The Salutation in Kent. 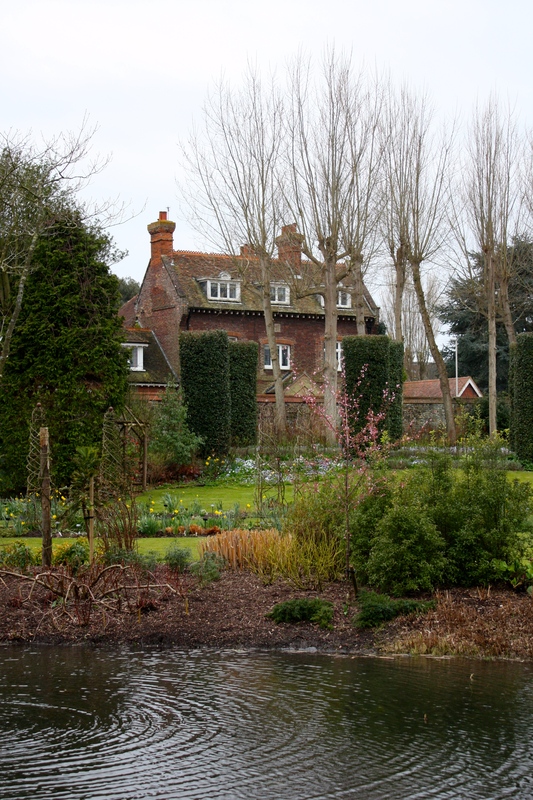 In December 2013 a freak tidal surge in the English Channel inundated the grounds of Lutyens’ superlative Queen Anne style house, leaving up to 5ft of standing water trapped behind the high banks that were intended to guard against such an event. Head Gardener Steven Edney said “it made me feel a bit sick” when he surveyed the garden the morning after the night before. And who could blame him? Most of us have had to deal with one kind of gardening disaster or another, but few of us have had to rescue a garden of great note from a catastrophe of such magnitude. Fortunately for the owners of The Salutation (Dominic and Stephanie Parker of Gogglebox fame) their Head Gardener is made of stern stuff, a true Man of Kent. The next day Steven and his team waded in, literally, rescuing whatever flotsam and jetsam had floated to the surface. Over the next week five million litres of sea water was pumped back into the River Stour, revealing slicks of silt and putrefying worms – a soil ecosystem drowned and poisoned by salt. What would happen next was anyone’s guess. The flooding looked pretty devastating, fatal in some places. I hope Steven will not mind me saying that the long-term effects have not been as terminal as one might have anticipated. Some plants swung back into action when spring arrived, as if nothing had happened. Others grew but failed to flower well for a season, before getting back into their stride. A few collapsed outright, whilst a handful remain in the throes of a slow, painful death. Among them are certain varieties of climbing rose, but interestingly not all of them. What I enjoy about visiting any garden in winter or early spring is the opportunity to observe the underlying structure. The Salutation has it in spades. 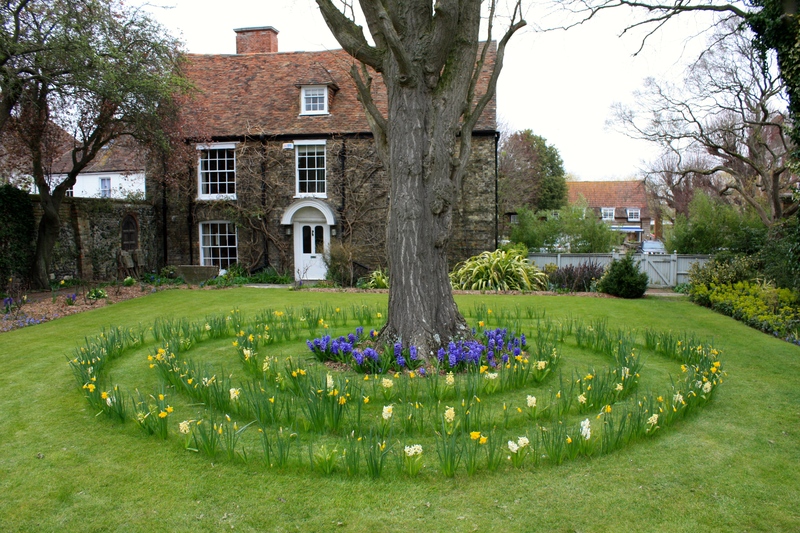 Lutyens was renowned for creating gardens with good cheek bones – always in perfect relation to his houses and with enough hard landscaping to contain and frame the ebullient planting typical of the period. Before too much foliage blurs the scene one can not only enjoy the great architect’s fabulously masculine gateways, but also views out of the garden to surrounding cottages and the solid, square tower of St Clement’s church. I suspect Lutyens and his rich clients wanted to do anything but look outwards, hence the high brick walls, dense hedges and poplar trees arranged around the boundaries. This was familiar territory for a man who designed hundreds of genteel village houses for customers who yearned for country life, but not necessarily the attentions of the locals. 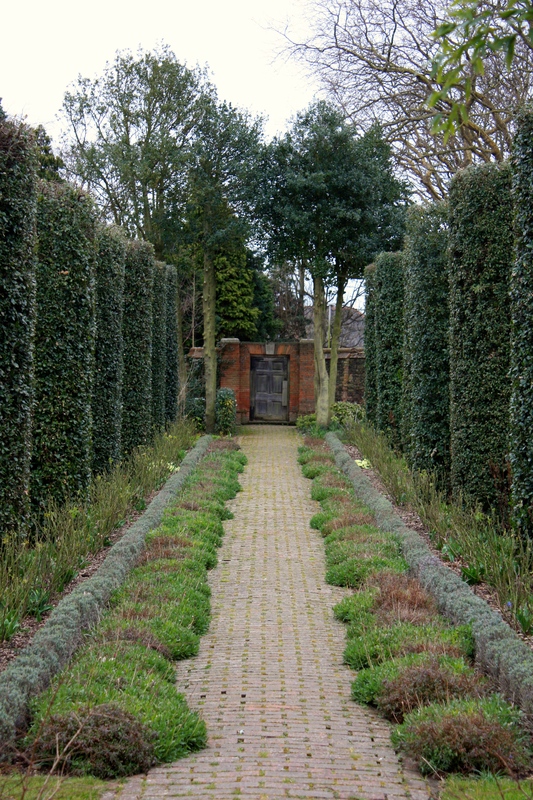 Within the garden yew hedges are carefully maintained to prevent their great thickness from rendering them inelegant. Yew will take drastic pruning and come back thicker and more lustrous for it. Columnar, clipped trees along the holm oak walk stand like soldiers, saluting the gardeners that have kept them that way for over 100 years, on and off. 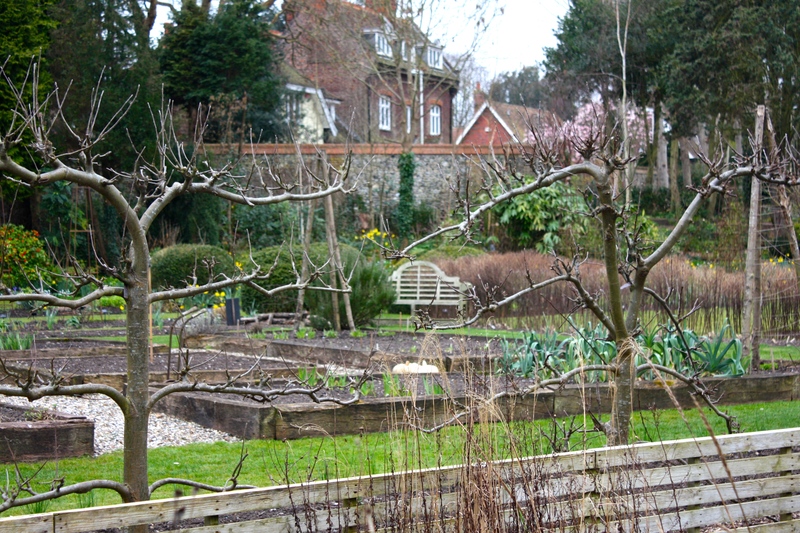 Even in the kitchen garden, furthest away from the house and probably not part of Lutyens’ original plans, there are well-trained espalier apple trees and tidy borders edged with old railway sleepers. In just a few weeks time, day perhaps, the poplars will start to fizz like limeade and soft catmint will begin sprawling over brick pathways. There will be bananas, cannas and other exotica near the house; roses and delphiniums in main perennial borders and dahlias everywhere one turns. This year Steven will plant a new border near the spring meadow with over a hundred varieties, organised by colour rather than flower shape. The Salutation will once again be a riot of colour, a fanfare of flowers, a triumph over adversity and a tribute to the combined skills of designer and gardener. (Photographs taken on rather dim, blustery Easter Saturday). Glad you enjoyed the post Judy. It was rather a grey, windy day so nothing would stay put long enough to photograph. We have season tickets so can go back as often as we like. How shocking that the English Channel got into the gardens! I know. Once upon a time Sandwich was a major port, but it’s now 2 miles or so inland. Since 2013 new flood defences have been built so hopefully the English Channel will, in future, stay in the English Channel. I have been waiting for your report from that beautiful place. Thanks for sharing your thoughts and photos with us. The gardens are really breathtaking. Have a nice day Dan. Happy to oblige. The Salutation is our nearest garden of note and never disappoints. I enjoy the structure and sense of containment, but mostly the adventurous planting and Steven’s great enthusiasm for his job. Lovely, I visit frequently and have been overwhelmed by the way in which the garden has recovered. The team there work miracles. I think I achieve a lot but am humbled whenever I visit. An amazing story. I regret not visiting when we were in the area a couple of weeks back. Definitely now on my to-see list. If you can make it, go in August or September when the gardens are really bold and billowy. They are a lovely contrast to the very formal, solid, symmetrical house (which one day I am determined I shall live in – dream on!) Here’s a post I wrote about the garden about a month into writing this blog: https://frustratedgardener.com/2012/07/19/the-salutation-sandwich-part-2/. Feels like a lifetime ago! I saw the programme, and feeling sick is a wonderful bit of English understatement. The gardens are a tribute to his cussedness, as in Man of Kent!, and the forgiveness of nature which mostly always gives a second chance. It is the redemptiveness of natural growth that is so amazing about gardening, I think. I think I would have felt more than a little sick Alison, but then no-one has ever described me as understated! The wet winter that followed must have helped wash some of the salt out of the upper layers of the soil, but a remarkable recovery nevertheless. So very beautiful and a testament to nature and man. Plants want to survive and grow, this is what I tell beginners all the time. I can’t wait to see the garden for myself in a couple weeks! Will you be in Kent so soon? How exciting! Do go to Goodnestone too if you get the opportunity and have a look at the National Gardens Scheme website to see if there are other little gems open. http://www.ngs.org.uk/?gclid=CJzNqPrci8wCFcR92wod_TMEdQ. I hope the weather is kind to you as it’s been quite cold so far this spring. Your cold has looked balmy compared to the temperatures we have been having this spring. Some of my daffodil buds and leaves were turned to mush by our spring. I have never seen that before, usually they just bounce back. My husband and I were at Salutation Gardens last September. The borders were full and colourful and no sign of any past flooding at all. If interested you can see my blog post on Gardeningpomona. I am thoroughly enjoying your photos because as you say you can see the bones of the gardens. There is quite a different look and feel that makes me want to hop on a plane this instant! Enjoyed your post Patty. You did well to get there. We live in Broadstairs so are half way between Botany Bay and The Salutation. How funny we wrote something so similar within a few days of one another! I loved being reminded of the exuberance of late summer, thank you! It is on my to do list to visit this garden and I remember the freak weather that it encountered…it is looking none the worst for wear now…well done to those splendid gardeners who brought it back form the brink! A truly remarkable recovery. I can’t imagine what that much sea water would do to a garden, much less how anyone would begin the clean up. I don’t like to overdo the praise but clearly Steven and the team are not half bad! Hear Hear! You are right, it’s an unusual problem and hence very people can advise what to expect. I am thankful my garden is on top of a cliff! The tenacity of gardeners knows no bounds!! Until the last photo I thought how serene and peaceful the garden looked – superb photos – I’d never have guessed that it was a windy day.. 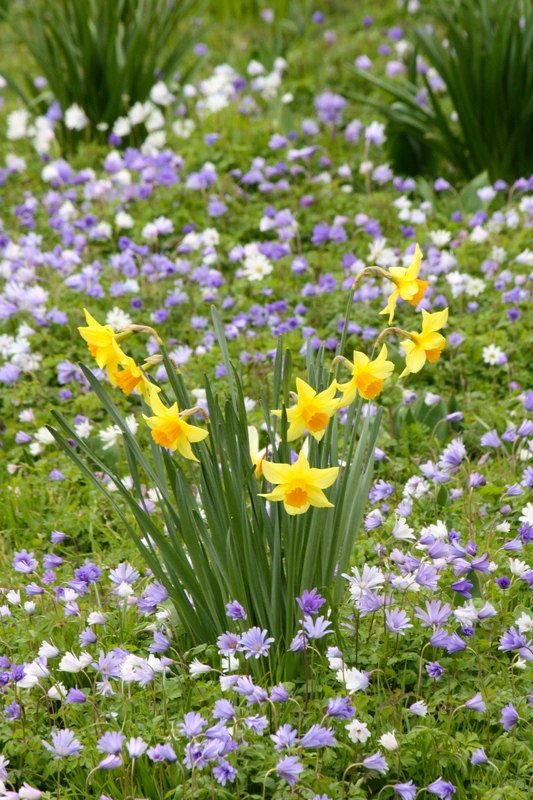 The photo with daffodil and windflowers is just delightful!!. We live on an elevated site so no fear of flooding – high winds are our problems but the great views make up for it!! As my late friend would often say ‘if it’s not pigeons, it’s crows’……………………. That’s kind of you Sally. It was awfully dull so I was worried the photos might look a bit depressing. I wanted to capture the meadow from a wider angle but little flowers are quite difficult to make look impressive from a distance! Lovely post. I’ve been but now struggle to remember when it was: my feeling says it can’t have been that long ago but everything was so lush and beautiful it must have been the summer before the floods? If not, I would never have guessed. Loved the quote “In the midst of winter…” which I had not come across before but will remember now. Thank you! The garden got back on its feet terribly quickly Stefanie, so your memory might serve you correctly. I liked that quote too. Very apt I thought.